Order an apostille for just £54.00! SFS can provide an Apostille Certificate for virtually any UK document. Our fees start from just £50 + VAT and we will advise on how your specific document needs to be treated to ensure it is accepted by the overseas authority you intend to present it to. The Apostille Certificate is a certificate attached to a document in its country of origin and confirms the signatures or stamps on the document are from officials or recognised bodies within that country. 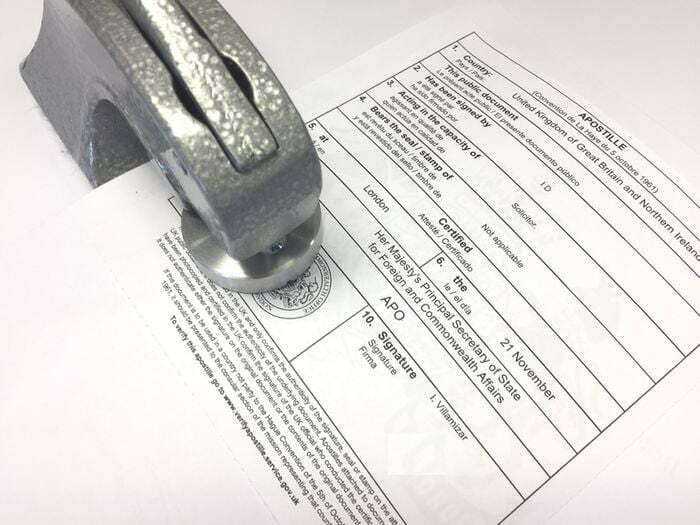 When a document bearing the Apostille Certificate and Stamp is presented in another country it will be accepted as a legitimate document without further evidence. Apostille Certificates are issued under a Convention of the Hague Conference (la Conférence de La Haye) and will be recognised in over 60 member states. Many non-member states also recognise the Apostille Certificate and seal. Many documents can be legalised with the apostille without any additional certification. If the document has the signature or seal of a recognised government body we can process the original document. If you are not sure if your document requires certification please contact us. We provide solicitor certification when documents are not already signed or stamped by a recognised official. Offering an inclusive service saves you both time and money visiting expensive solicitors. Let us take care of the complete service for you. We can certify many documents for you but some will require certification before they are sent to us. Please contact us for advice. Some countries require their UK based embassy to attest documents before they will be accepted. Often the apostille certificate is still required and then a further attestation stamp is need from the embassy of that country. We cover many different embassies, please contact us for advice. We offer a dedicated apostille service. Quick and Low Cost! We have been providing an Apostille certificate service and document legalisation services since 1998.